I have to admit, this is the one recipe that motivated me to buy this book ASAP. My son loves potato bread. 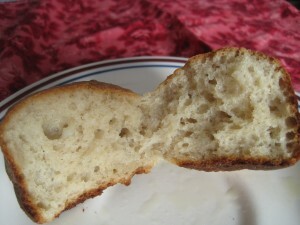 Sadly, my own efforts to de-allergenize regular potato bread recipes were failures. So this is the recipe I tried first. The result: A surprisingly tender bread (I made them into rolls instead of a loaf) BUT see how the outside is over-baked? I made the big mistake of using my dark pans, and this was before I knew how to adjust my baking temperature for dark pans. Sad. I need to try this recipe again and either use my aluminum pans or remember to adjust for the dark pan. I haven’t, though, because it’s a bit too much work for me to first boil a potato and then mash it…. 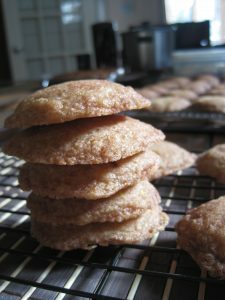 These snickerdoodles are made very similarly to the way regular snickerdoodles are made but, of course, without the butter and wheat flour. The cookies are buttery and yummy, but not overly sweet. Will definitely make these again! It’s a bummer one has to buy special madeleine baking trays to make these. But I decided to make the investment, because the 10-year-old daughter (who has no food allergies, thank God) loves madeleines and hasn’t had any in ages. I did something silly and ordered madeleine trays that were a bit dark (why do they even make these?). I decided to play it safe and adjusted my baking temperature. 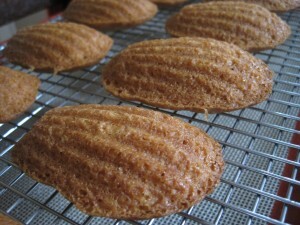 As you can see, the madeleines turned out perfectly. These are a bit crunchy on the outside, soft and tender inside, with a mild tart flavor. 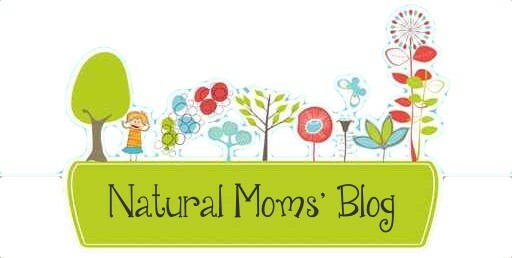 Another hit with the food-allergic DS! 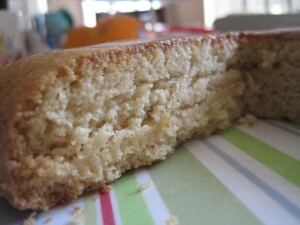 Just look at the light, airy and tender crumb of this cake! It’s almost like ordinary yellow cake. But it tastes a little, I don’t know, flat to me. I wish it were more delicious. But I used this for my assignments in the Wilton Cake Decorating Course I took recently. It’s not too sweet, which makes it perfect to slather with icing (using the veganized Wilton recipe for buttercream instead of the one in the book). The chocolate cupcake recipe in this book is amazing! It’s absolutely delicious and the texture is perfect. My husband said, if nobody had told him it was gluten-free and vegan, he would have thought it was a “normal” chocolate cupcake. Now that’s a gluten-free, vegan recipe I’m looking for! 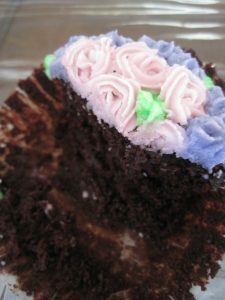 This is now my go-to recipe for chocolate cupcake. I used this for my cupcake assignment during the Wilton course. I gave some away to my neighbor (who, after five heart attacks, sure appreciates the value of a cholesterol-free cupcake), and he couldn’t believe it “didn’t have all that stuff,” either. I also made these for a summer picnic, but topped them with the Sunbutter Buttercream from the book, and they were a huge hit. Will definitely make that buttercream again. So what are my thoughts on this cookbook? Read on. With over 100 recipes, you’re bound to find the recipe for almost any baked good you can think of. It’s got muffins, scones, biscuits, quick breads and coffee cakes, cookies, cakes, cupcakes, pies, tarts, crisps, crumbles, cobblers, puddings, betties, buckles, yeasted baked goods and savories. You’ll learn how to make an all-purpose gluten-free flour blend, which you can use to replace wheat flour, cup for cup, in ordinary recipes. Actually, you’ll learn two GF blends: one for cakes, cookies and pies, and another for yeasted breads. The recipes have obviously been tested. Cooking times are accurate, textures are great. The recipes just plain work and will “fool” non-GF, non-vegan eaters most of the time. 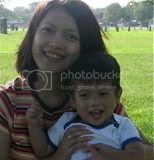 The author, Cybele Pascal, is accessible through email, her blog and her Facebook page. I sent her a couple of questions and she responded promptly. Most of the recipes tell you to use a stand mixer. 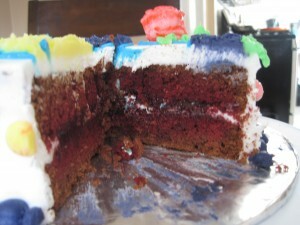 You can probably use an ordinary hand mixer for all but the thickest of batters. Gluten-free batter tends to be very sticky and will crawl up the beaters of your mixer. This is why I bought a stand mixer. However, I know other people use a hand mixer anyway or just stir by hand. It will be harder, but it can be done. Half of the recipes use egg replacer, which some people don’t like. I also think using egg replacer is silly if the recipe already has a thickener (such as cornstarch, potato starch or tapioca flour), xanthan gum, baking soda and baking powder. Why? Because those are the ingredients of egg replacer! A few recipes call for Karo syrup. I don’t buy Karo syrup or any other corn syrup. Neither do I plan on giving it to my children. I’d replace this with honey, maple syrup or agave nectar. All the recipes, except the yeasted ones, use mainly rice flour. If you’re on a rotation diet, you’ll need bean-based recipes, such as the ones in the Babycakes cookbook or Super Allergy Girl’s Cookbook to rotate with these. If you need to bake without gluten, wheat, dairy, eggs, soy, peanuts, tree nuts, and sesame, The Allergen-Free Baker’s Handbook should be in your kitchen. You’ll have fool-proof recipes that taste as good as (or almost) regular baked goods. 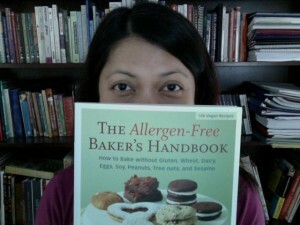 The Allergen-Free Baker’s Handbook retails for $25, but you can get it for $8.56 (34% off) at Amazon.com. 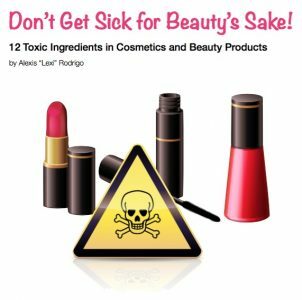 Or enjoy free shipping (to selected countries) by ordering it from Book Depository (the cover may be different, but it’s the same book!). Either way, try it and let me know how your allergen-free baking goes! PS: The links to the book are affiliate links, which means I’ll earn a commission if you purchase the book, or something else, through the links on this page. Nevertheless, this review is an honest one. I’d still recommend this book even without the affiliate relationship.